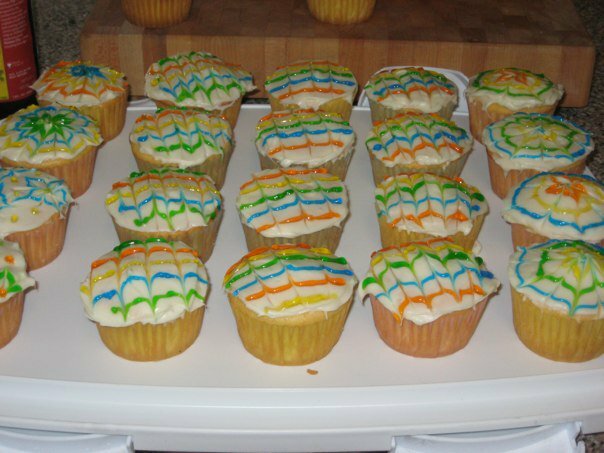 I made these cupcakes a couple summers ago, but the icing trick could be used to make Halloween spider cupcakes. All you need is a cupcake covered in icing, a tube of gel-based icing in any color(s) of your choice and a tooth pick! The 2 designs on the left and center are created almost the same way. 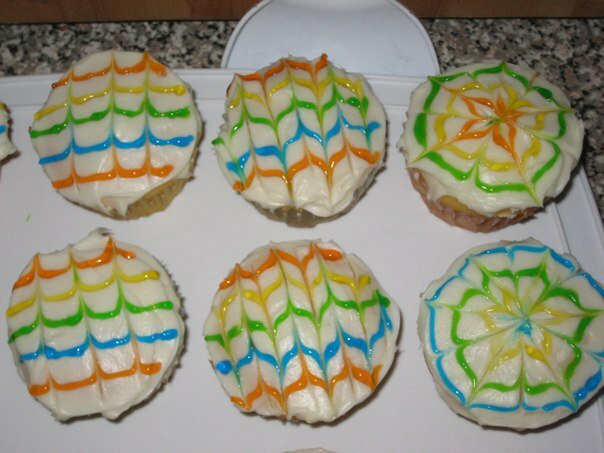 Draw lines with the gel-based icing, I would space them at least 1 cm apart. Then take a clean tooth pick and drag a line intersecting the icing lines (only drag the tooth pick deep enough to move the gelled icing or else you will end up with a crumby design!). Repeat this step until your cup cake looks like the cup cake on the left in my picture. To get the center cupcake design, you follow the same steps from above, only when you are dragging the tooth pick to make lines, you alternate the direction you draw the line. If you drag a line from left to right, the next line should go from right to left. You can play around with the number of lines and directions to come up with unique designs! The design on the right that could be used to make spider web cup cakes uses the same method, only instead of drawing lines with the gel-icing, you draw circles! Pretty cup cakes , its such a lovely nad easy way to make designs.